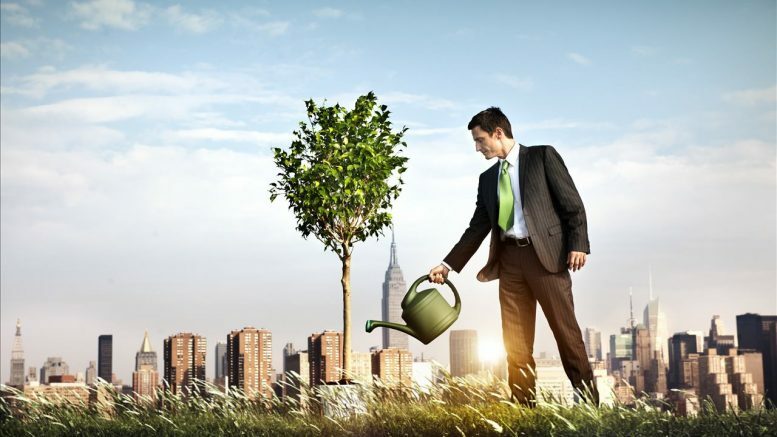 What determines the sustainability of your commercial enterprise? What makes it profitable? An answer is in the balance of investment into innovation and production, writes John Egan. You are a product manager or director of a start-up company. You are a business unit manager or are running a small or medium enterprise. You are leading a large company with integrated multinational subsidiaries. Whichever applies, you could have in mind a representative product that is emblematic of your enterprise and which embodies your commercial endeavour. In doing your job you have your hands on two levers. One is an investment plan which, over time, should deliver an expected business performance. With the other you can control the costs and set the price of your representative product. What determines the sustainability of your commercial enterprise? What makes it profitable? Answers to these questions are likely to be very varied for different organisations and will depend on your particular circumstances. Here we seek to uncover something more fundamental about your enterprise by treating it as an energy dissipative system. With this in mind you could try to imagine your business plan as the raising of a value surface which maps the varying perceptions of value of your representative product across a population of consumers. Your investments fund the exertions to elevate this value surface to a point where some consumers value your product sufficiently to purchase it. Treating the enterprise as an energy dissipative system also means that it will retain some of the investment as a potential energy in an elevated value surface, representing those consumers who also value the related products but not at a level that would compel their purchase. We call this retained investment the value surface energy. 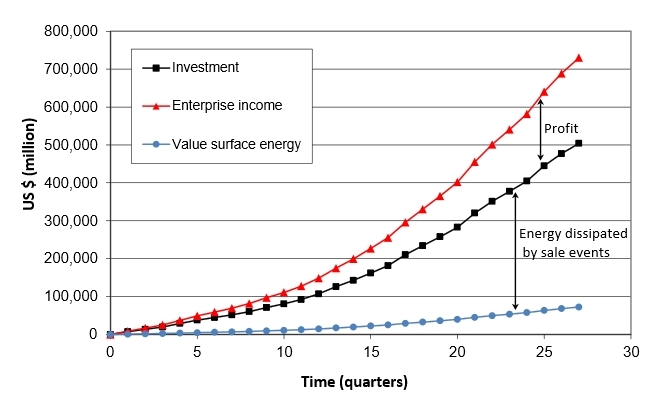 The difference between the value surface energy and the total investment made represents the energy “dissipated” by the enterprise through the sale of its products. You will also need to understand the market for your representative product. To understand how these two numbers describe your commercial enterprise, let us start with a primary goal – to make your business sustainable, that is where income exactly matches investment and can be recycled to fund a sustainable future. The algorithm of the energy dissipative enterprise allows the estimation of the values of qs and xsd that give rise to this sustainable behaviour for 12 scenarios, which differ only in the percentage of original investment retained as value surface energy (VSE) as shown in the table below. The chart below takes these qs and xsd values to create a “sustainability limit” curve along which an enterprise can just survive. Below this curve the business will not be sustainable (without external investment). Above the sustainability curve the enterprise will become profitable. For a particular case where the retained value surface energy is 50 per cent of the investment, we have estimated enterprise parameter values in the additional cases of profit and loss as a percentage of the investment as shown below. It now becomes clear that qs is unrelated to profit and it sets the fraction of the original investment that is retained at any time in the elevated value surface. On the other hand, xsd uniquely adjusts the level of profit or loss achieved by the enterprise in proportion to its adjustment above or below its sustainability value. As xsd increases it describes a market in which a higher proportion of its consumer population will attribute a greater value to the goods. 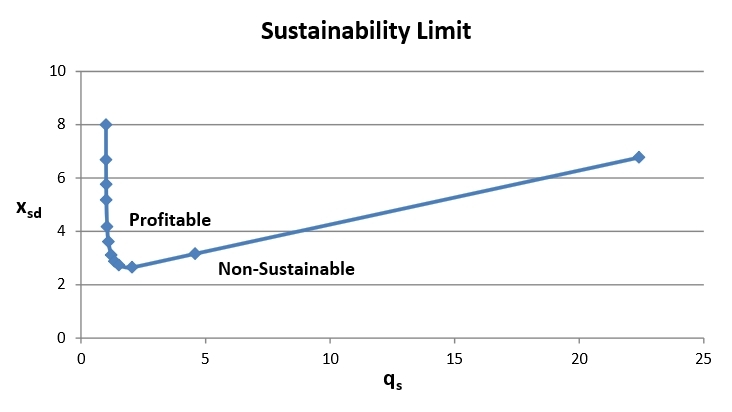 The “hockey stick” geometry of the sustainability limit curve shown above brings with it some unexpected implications. For both the lowest and highest values of qs, corresponding to a low and high-value surface energy, a higher value of xsd is needed for an enterprise to achieve sustainability and become profitable. Conversely, sustainability is at its most accessible, in terms of requiring a low xsd value, when the value surface energy is about 50 per cent of the investment. As you plan your business you will wish to know how you should balance investment into two fundamental enterprise activities: innovation and production. We have referred to innovation as the creation of the information that communicates a perception of value through a consumer product interaction (CPI). This now appears as the height of the value surface, which itself is determined by xsd. A consumer market defined by a high xsd will find more itself receptive to the products making their value surface easier to elevate. Production, on the other hand, is about the replication of that same information to disseminate value perceptions across a population of consumers and to bring about multiple sale events. Lower values of qs indicate a greater proportion of sales in that consumer population, together with a lower residual value surface energy. With this approach to uncouple labour into its two constitutive components of innovation and production that respectively are responsible for the creation and replication of value, we have a tool to better understand the operations of your enterprise. Pure innovation would involve the creation of high perceptions of value for something that cannot be replicated or sold. Investment would be completely retained within an elevated value surface. This state would occupy the right-hand fringes of the sustainability limit curve. Pure production is also inherently unsustainable as it would involve the replication of a product with zero value. Sustainability would require a value surface that is infinitely easy to raise. Minimal investment would be retained in this value surface at any time and sales would be immediate and effortless. This state would occupy the left-hand fringes of the sustainability limit curve. Somewhere between these two unrealistic scenarios is where your business will sit. You will have to decide where. Part of that decision will be linked to the prices you wish to associate with your goods, which is linked to the productivity of your enterprise. We will explore these important issues in a future article. You may prefer to adjust these assumptions by, for example opting for a different statistical distribution of consumer perceived values based on empirical evidence. Our assumed half-Gaussian distribution of value perception is selected to demonstrate the concept of the energy-dissipative enterprise. The least squares method used for this parameter estimation is a numerical optimisation technique whereby outputs of a computer simulation can be ‘fitted’ to real-world data. The least squares approach follows an iterative process to continually improve upon the match between the simulated and the real, to hone in upon a best-fit simulation so that its parameters can describe real behaviour. As would be indicated by an infinite xsd value. Be the first to comment on "On sustainability and profit"